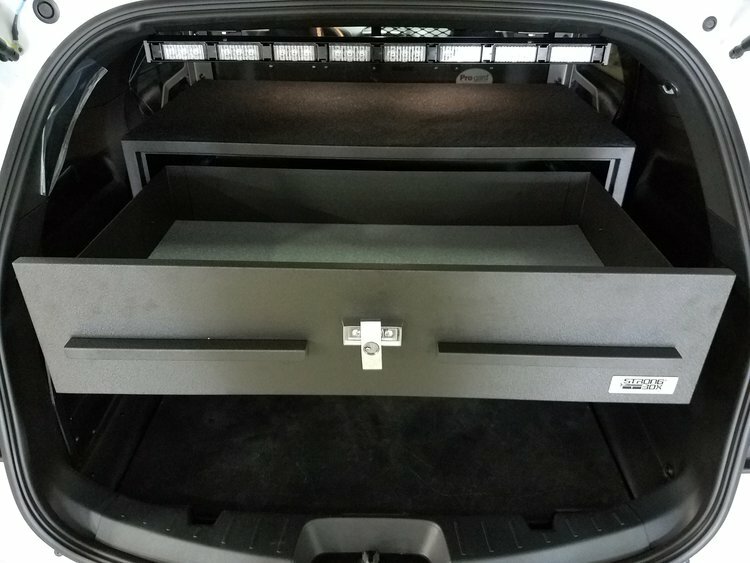 The 7126-7611 with Stand pull out drawer is built specifically for the Ford Interceptor SUV and is one of our most popular setups with Police Departments. This box is great for securing your AR's, pistols, mags, laptops, weapon accessories/gear and more. Made with a single high security Medeco lock (combo lock option available) with protected T-Handle and 3-point latching system this box is more than secure to protect your most important gear. Each weapon locker is constructed of cold rolled steel and powder coated in wrinkled black. Made in America our boxes are designed and manufactured with the best material and without compromise. Welded and multi-return flanged drawer and front for extra strength. Our top loaders are built to be universal with the ability to fit virtually any vehicle. They are designed to provide vehicle storage security while maintaining normal cargo space. Made with doubled (or single) Medeco High Security Locks this box is more than secure. The lock cams are shielded to prevent damage to the contents and to prevent tampering. Each weapon locker is constructed of cold rolled steel and powder coated in wrinkled black. Made in America our boxes are designed and manufactured with the best material and without compromise. Outside Dimensions: 10"W x 8"D x 5"
Our boxes are built to secure so you can have the peace of mind that your gear is safe. BOSS StrongBox™ has grown to represent leadership in security, high quality and exceeding customers expectations. Our mission is to give you peace of mind and confidence to know your weapons and gear are secure. Our boxes are universal and can be used for many applications based on your needs, from large pull out drawer systems to small boxes for specific gear. Our boxes are designed with with feedback from local and federal law enforcement officials to ensure we build what you need. Each box is constructed out of cold rolled domestic steel and powder coated in wrinkle black. Made in America our boxes are designed and manufactured with the best materials and without compromise. We stand by the quality of our products with out lifetime guarantee. All our boxes carry a 100% satisfaction guarantee against defects in original materials and workmanship. If your BOSS StrongBox™ products show evidence of such defects, BOSS StrongBox will make every accommodation to fix, repair, or replace your product in the most expeditious manner possible. All of our boxes are designed and manufactured in America. We stand by the quality of our products and are very proud to keep the process here in America.